In this moving fiction journal, the main character, Grace, uses her journal to tell about life in the small town of Dalhart, Texas during the Dust Bowl year of 1935. In a voice that feels very authentic, she conveys the extreme hardships endured by children of the dust bowl -- both at home and at school. But, Grace also incorporates touching small glimpses into the tiny joys that kept people going (most memorable to us was the joy of a child getting a new dress made of out an old flour sack!) Throughout, readers can really relate to this young girl who is just like children today, only living in a very difficult time in our country's history. We favor Out of the Dust to this title, but both provide compelling windows into the era through the eyes of a child. 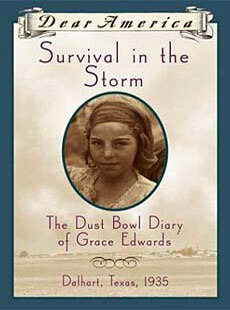 There are so many great fictional accounts of children of the dust bowl, particularly for this age group, that perhaps teachers could have some kids read Out of the Dust, some kids read Survival in the Storm (this book), and some kids read The Journal of CJ Jackson -- then discuss these fictional accounts to see common experiences of the main characters (of which there will be many!) Kids will certainly never look at the great American dust bowl the same again! What an amazing role model she is for other young aspiring writers, and what a great way to 'prove' to kids that age doesn't matter. They can create engaging stories and interesting information writing at their age too!